The River City Quilt Guild show is June 13–15. 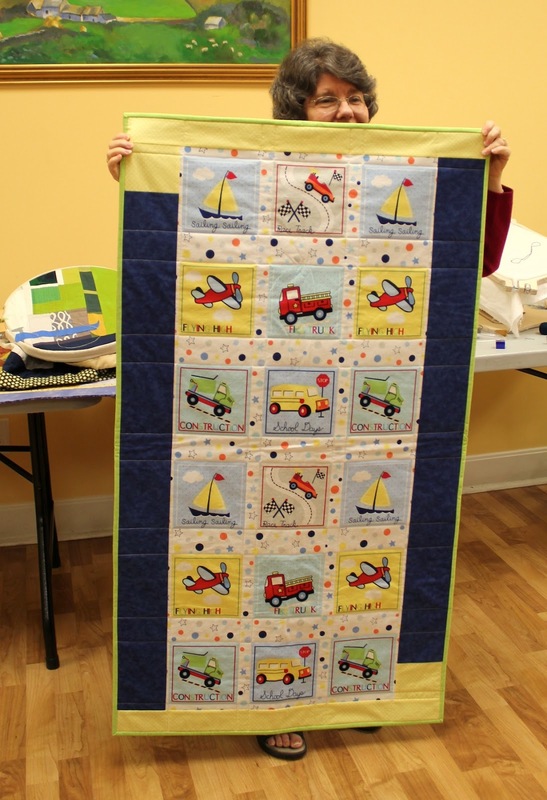 If you have a quilt to display in the show, please bring it to the June CMQG meeting. Quilts must have a sleeve and a label. 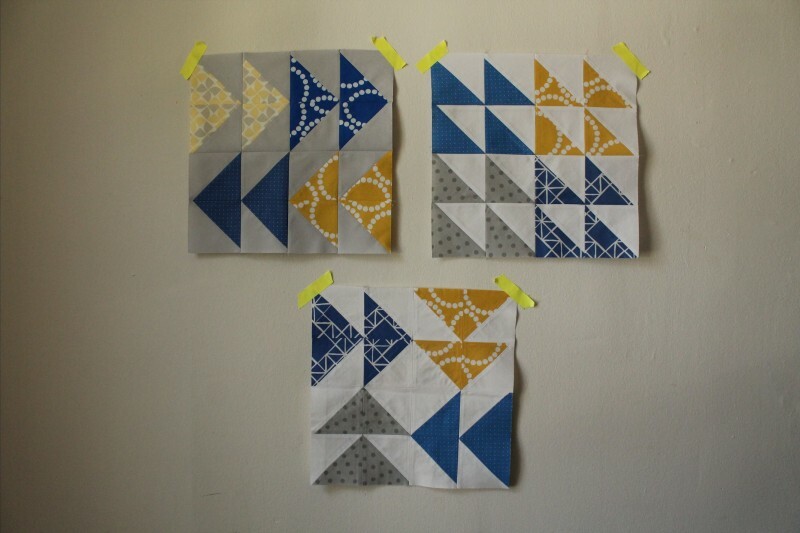 Send an email to cincinnatimodernquiltguild@gmail.com ASAP if you are entering a quilt, because they need to know. The show is in Finneytown at the Baptist Church. Also June 13–15 is the Creative Festival at the Convention Center in Sharonville. The Louisville show Sew Original wants our Dresden quilts and our Ohio Star quilts to show in their expo. We are going to have a booth in the show also and need to have it manned during the expo. Please consider this opportunity and email cincinnatimodernquiltguild@gmail.com if you can do this and also to let Jessica know if you want your quilt in the show. Sew-In this Saturday, May 11, at the Madeira Library from 11:00 a.m. to 4:00 p.m. If you want to order lunch, please bring $6.00 and we will order from Panera. The Shop Hop will be on Saturday, July 13, organized by Kara Sanders. There will be a small fee for transportation. The route will probably start out at Sewn Studio, then Lavender Street in Montgomery, then Fabric Shack in Waynesville. We can rent a 15-passenger van for this. Charity collections for Boston were received at the meeting and can be brought to the Sew-In on Saturday also. You can also make some and send them on your own next week if you want to contribute to this. The Boston MQG is receiving blocks in a specific color scheme for charity work for victims of the bombings at the Boston Marathon. And the Vancouver MQG is organizing a flag banner for the city of Boston also. Christine made a pretty yellow and gray block. Sheila brought a pretty block. 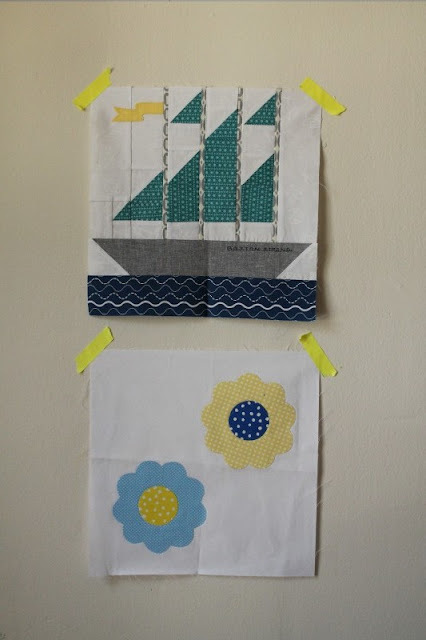 Teresa brought a ship block that she made and is pictured on the BMQG website! Janie made a friendship block. Ellen made a flag with Xs and Os. Gillian made an origami crane flag. The first Sew Down, a national event organized by the Modern Quilt Guild, will be held in September in Philadelphia. Registration will open toward the end of May, and even though our guild won’t be a member of the national guild until July, we can let them know of our intent to join in July to obtain the discounted member rate for registration. Member Kayla Wilcoxson is a consultant for Thirty-One and has offered a fundraiser for CMQG toward our national guild membership. Members can buy the Large Utility Tote, Top-a-Tote, or Pocket-a-Tote, and she will donate 15% plus her profits toward the national dues. If we buy 16 bags total, we can pay for all of our $200 dues for this year (July through December). Orders need to be placed by next month’s meeting. Another fundraising opportunity is via F&W Media, who is publishing a small publication for sale at JoAnn’s stores. F&W is very interested in making a 32-page pamphlet on our guild’s Ohio Star quilts from the 2012 IQF. Their idea is to showcase our Ohio Star quilts by including a photograph of all of them and then including a pattern for 5 to 8 of them. So we are very interested in this, because the remuneration could be very good and be used toward the national membership and also compensation to the pattern writers. All of the instructions would be needed sometime in June or early July. You wouldn’t have to remake your quilt but write the instructions and go through the process on paper. If we don't get enough patterns from the original quilt makers, we may need members to create Ohio Star quilts and write instructions for this project. Christine will be notifying the guild as to the status of the project the week of May 20. F&W is also interested in doing a booklet on Tula Pink’s new City Sampler book. 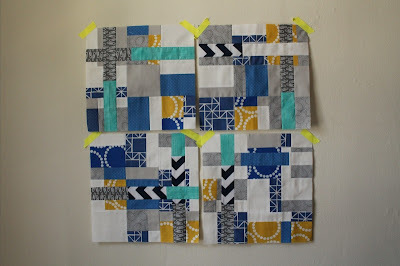 If we chose this option, we would make her City Sampler blocks using JoAnn’s fabrics. This could be tough to organize but perhaps we could do this at a special Sew-In organized only for this purpose. There’s also a Farmer’s Wife book and a Civil War book. These could all be group projects or individual members can take on one of the books, too. Either way, these projects have a quick turnaround; the compensation would be less than that for the Ohio Star project. Contact Christine for more information. Several members met spontaneously for happy hour one night and had so much fun that we decided to schedule a guild happy hour open to anyone! All will be from 8:30 p.m. to ??? For the May challenge, several members and even guests made beautiful nametags using the colors from our CMQG logo and blog header. Jessica brought two prizes from Lavender Street that weren’t given away at the Modern Meetup, a tote bag and a fat quarter bundle. And Ellen brought a book that she won at QuiltCon titled We Love to Sew, by Annabel Wrigley. And the winners were … Amanda won the book, Sister Ann won the bag, and Kathy won the fat quarter bundle. 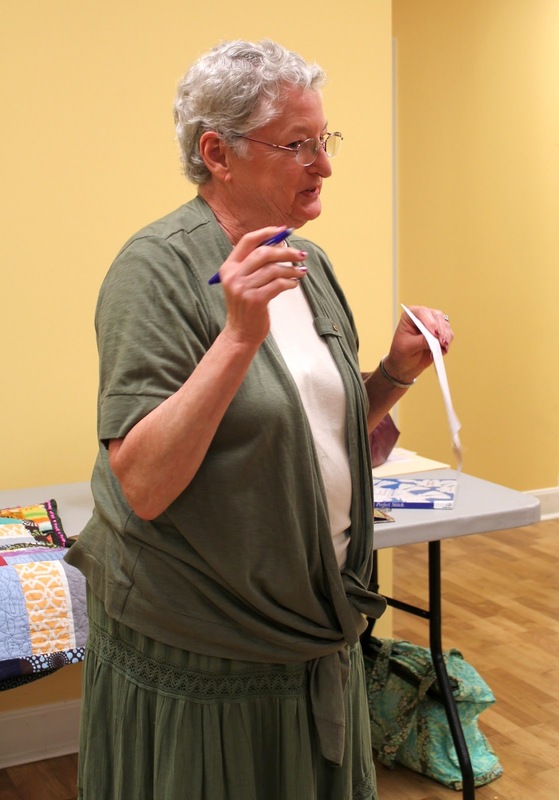 After the break, Ellen introduced a demonstration on hand quilting by Sr. Ann and Lisa. Sister Ann never took any formal classes in hand quilting but learned when she was a child by filling in the spots that the adults had missed when the quilt needed to be turned on the large frame. Nobody does the same stitches, and even the same person won’t make identical stitches. 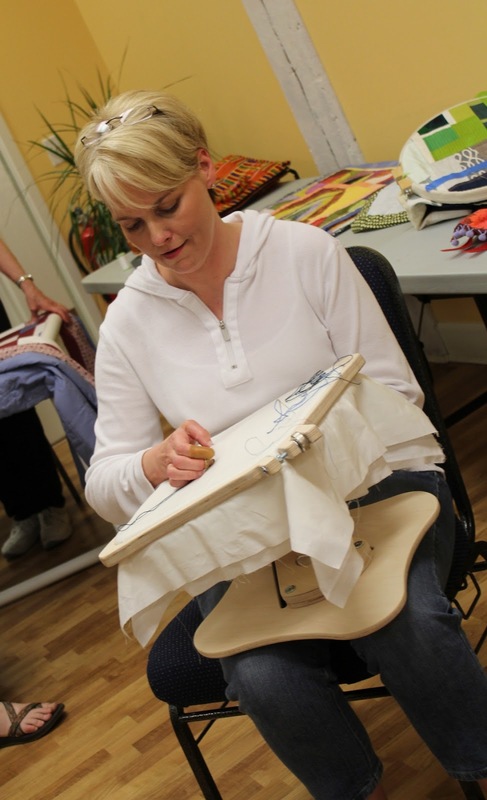 She taught her method of taking several stitches at a time and rocking the needle back and forth, and then let members give it a try for themselves. Lisa demonstrated two different techniques. 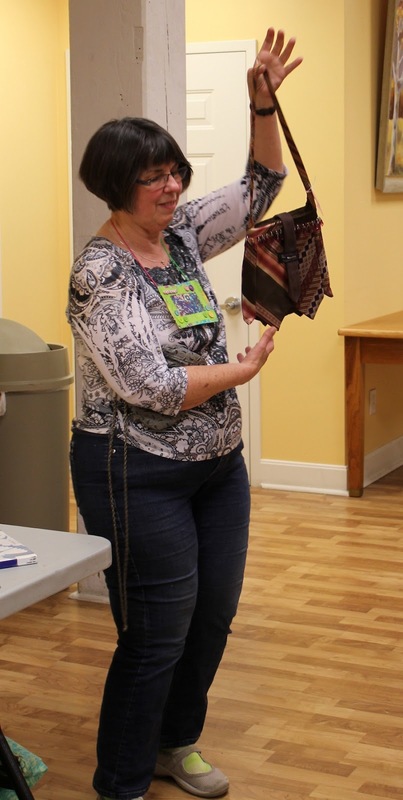 She explained some differences in needles and threads and the difference between quilting tighter vs. looser woven fabrics. 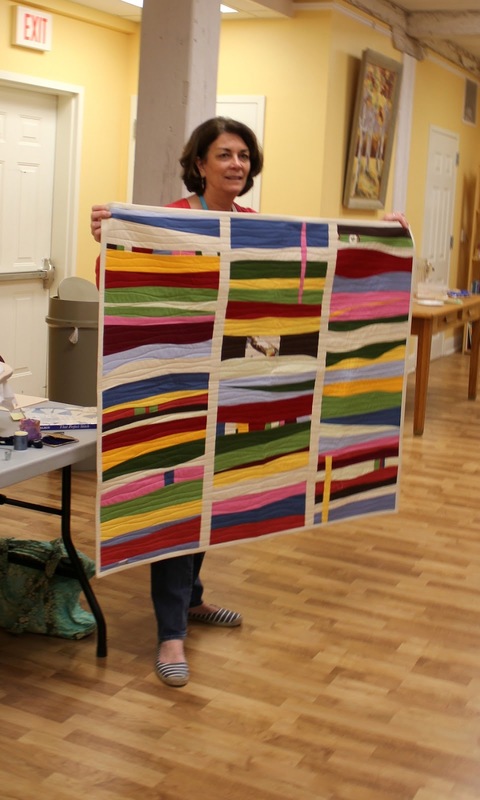 She showed several quilts and small projects that she has made over the years and recommended a book called The Perfect Stitch, by Dierdre McElroy. Next month’s challenge is to hand quilt something. Lisa’s advice: quilt something small! Janine promised to post her recipe for the sweet-and-salty crackers she brought for refreshments. 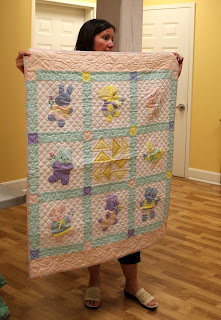 Gillian showed a sweet baby quilt (it’s baby season in Gillian’s world) for a new baby named Sylvia, done in Appleville fabric. 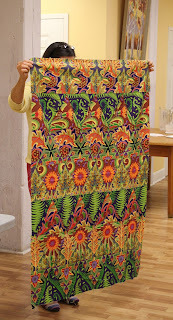 And she showed a quilt top she made using all one line of fabric by Tula Pink, Parisville. Ellen and Michelle wore skirts they made at Camp Stitchalot in Michigan. Another Camp Stitchalot is coming up in August. And Ellen showed a purse that she made in Katy Jones’s class as well as Katy’s book, 25 Patchwork Quilt Blocks. 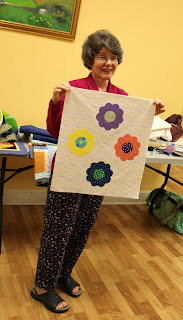 Janie showed a colorful quilt top she has in progress using Jane Sassaman’s fabric. This is a project she works on a little, puts it away, then repeats. 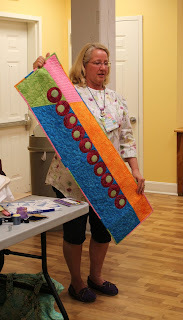 Teresa showed a beautiful panel she began at QuiltCon and completed at home. She quilted in with wavy lines. She’ll hang it in her kitchen for some color. Guest Lynn Whitley from Lexington brought some coupons for her fabric shop, Q—First in Quilting, just south of Lexington. 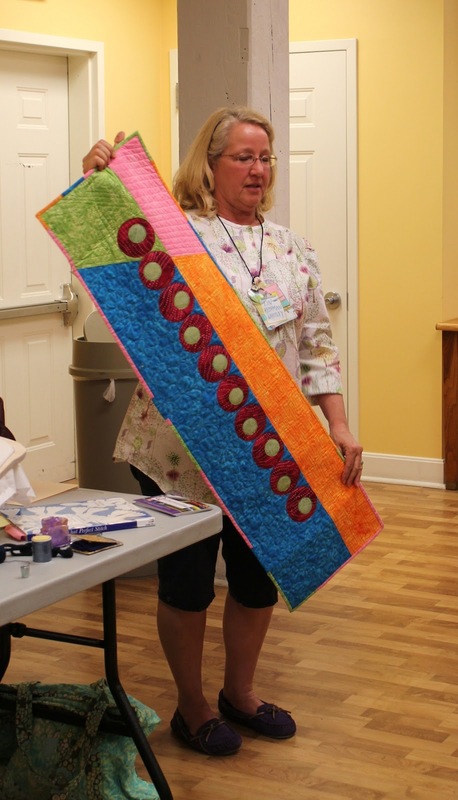 She showed a picnic table runner that was her first experiment with free-motion quilting. 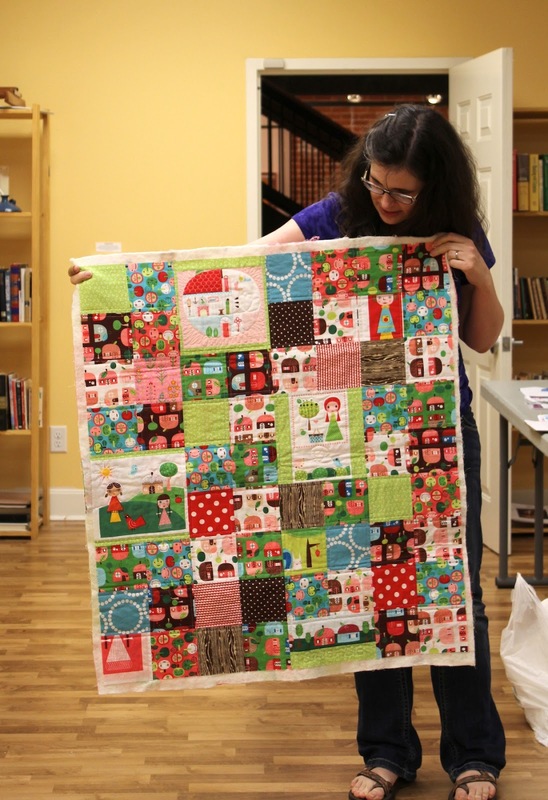 Janine showed a cute baby quilt. 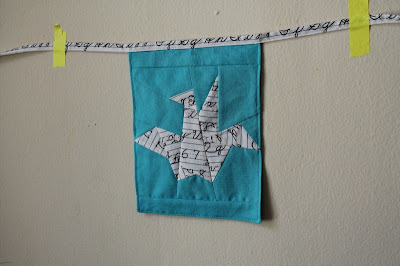 Inspired from last month’s challenge, Carolyn showed an upcycle project that she bought for $0.49. It was made from men’s ties. And she showed another purse made from one men’s tie. Carrie shared a fabric marking pen that has an eraser, the Frixion pen. Note that the ink irons off, but can reappear if the fabric is put in the freezer. To keep the ink off permanently, erase it or wash it. Carol brought a patriotic quilt she made, not for Quilts of Valor, but for a friend who has a son who was injured in the Iraq war. The backing is navy blue camouflage. For her great niece she made a doll quilt that is a leftover scrap she used in a quilt for her niece when she was a baby. And another quilt she made for a neighbor who recently had a baby boy. Heather shared that she taught at the Makerie in Boulder, Colorado, a couple weeks ago. 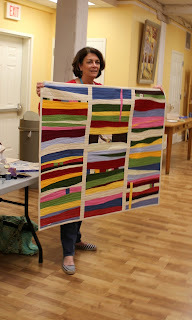 She brought the projects she made with the students in her class: an improv-pieced pillow and mini quilt. At the Makerie the instructors got to take a class from another instructor, so Heather took Amy Butler’s class, Creating Your Color Story, and she brought her project from that class. And she got to dye fabric in Kaari Meng’s class on fabric dyeing. Jessica showed a do.good.stitches quilt, an online bee that she’s in. The quilt is beautiful Flying Geese, inspired from Andie Johnson’s Flying Geese quilt in her (and Kelly Biscopink’s) book, Modern Designs for Classic Quilts. Please join us for our next meeting on June 12, from 7-9 pm at the Centennial Barn. ... are off in the mail this morning! Everything our group made was so great that I couldn't resist taking some extra pictures before sending them away. It's so inspiring to be part of huge collaborations of the Modern Quilt Guild like this! 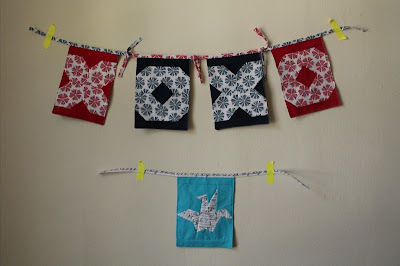 First the flags- Ellen's adorable XOXO set, and Gillian's paper crane. Had to get a close up of that one. Teach me your paper piecing ways Gillian! And these are the blocks that will be turned into lots of quilts by the BostonMQG. Janie's cute polka dots on top, and Christine's lovely pinwheel on the bottom. These fun blocks by Sheila are all made from HSTs. Cuteness overload here. Amazing ship block by Teresa and happy flowers from Carol. And these are my improv/ D9P blocks I started at Saturday's sew in with some of Sheila's fabrics. A collaboration within the collaboration! Even though we have sent our group packages out, there is still some time if you want to contribute individually. 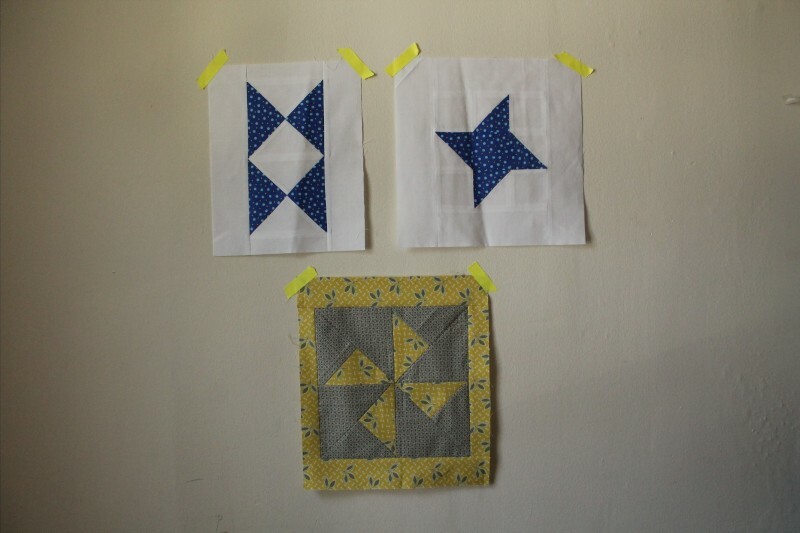 Find instructions and address for the Boston quilts here, and for the flag project here.